7'5" x 7'5" x 38"
Geneva is rated 4.6 out of 5 by 170. Rated 3 out of 5 by cola3812 from Great spa but it leaks We purchased our spa back in 2008. We love all the jets and how easy it is to clean the spa. However, after about 2 years, we noticed a slow leak in the spa. We have to refill it about once/twice a week to maintain the water level. We have a service call in and they are coming out next week to take a look. For the price we paid, it is a huge bummer that the shell leaks. Other than that - great spa. Rated 2 out of 5 by AlyS from Not worth the price jump We have owned a handful of hot tubs over the years and so far the Geneva has been our biggest splurge and also our biggest disappointment! Jet head popping off, water filter easily "gunking" up, jets in awkward positions, and a pressure distribution setup that we still haven't mastered. This spa is too "bells and whistles" for its own good, a prime example of too many things going on for everything to work properly. We definitely should have gone one of the much less expensive (probably back to the $5,000 range) to get the best value for a comfortable working spa. Rated 2 out of 5 by DarrenL from Very disappointed Waiting on a pump! I live in Northern Pennsylvania and the pump goes bad. Everyday for the past 3-4 weeks I've had to go out and fill the hot tub and keep a tarp of it to try to hold temperature and keep it from freezing. The hot tub needs to be completely drained to replace the pump. 7 degrees outside and I just spent an hour filling and working on the hot tub. No shut off valve to the pump so once again it needs to be drained to replace the pump. The service company called last week and wanted to come out Friday to do the work. That would have been great but it was only 25 degrees outside last Friday. I asked them to come out Monday as it is supposed to be 36 degrees. After the pump is replaced its going to take about six hours to fill the hot tub. Hopefully it won't freeze while I'm filling it. Once again very disappointed! Rated 2 out of 5 by gb0524 from Ongoing Issue First of all, I really like my Geneva Spa. But, I am having issues with the controls. First, they kept flipping upside down on the screen, and the options would not be aligned with buttons. Almost reluctantly, my dealer came out and replaced a circuit board. Now, the ability to play music through the bluetooth interface is gone...no menu prompts at all. So here's the worst part, I have to PAY my dealer for a service call for them to come out and honor the warranty. So this is just the first year......can wait for the warranty to expire. Rated 2 out of 5 by Dana from Broke down in 6 years I purchased my Caldera Geneva in 2006 right after I bought my house. The hot tub stopped heating in the beginning of the summer of 2013. I ignored it during the summer months due to the fact that it maintained a temp of 85-87 degrees. I called the business that I bought it from and they told me that it is only a 5 year warranty. I am extremely frustrated that I have to pay out of pocket when it is barely a year out of warranty. I thought it would have lasted quite a bit longer. I would not advise anyone to purchase a caldera spa. Rated 2 out of 5 by Maria from liner issues and dealer not responsive We love our Geneva spa and have enjoyed almost daily in the cooler months. We have three issues that keep this review from being excellent. 1. Dealer not responsive to calls and indeed will not return calls. After first year of operation, spa would not start up after draining and cleaning procedure. Took multiple trips and part replacement before they got it functional again. 2. Arm on lift broke shortly after that call. Dealer would not return call. We finally ordered the replacement arm and replaced it ourselves. 3. Drained tub today for semi annual water exchange and found quarter size patch of pearl finish flaking off liner in bottom corner near filter side. Why is finish flaking off? How quickly must this be repaired? No crack noticed just cosmetic finish. Also can you recommend another dealer in our area who can help. We are following manufacturers instructions exactly for control of water quality using Frog system. We live in Marion, Ma 02738 and would love to find a spa service repair who could help us with this. Spa is 2 years old. Rated 2 out of 5 by Spa from Geneva review The spa is very comfortable, but unfortunately we have to use a lot of chemicals, to keep the water balanced. I don't think the in-line chemical system works very well. Other people have had better results with a clorine system, or bromine/clorine tabs. The head rests are hard to clean and are getting moldy. Rated 1 out of 5 by DL from Third major leak and countless cracked panels Third major leak in a 12 month period. We have also had countless cracked panels and yes it has taken over a year to get one replaced. Now we have another cracked panel! Go figure! I've lost count on the cracked panels! The integrity of the frame for the hot tub is no longer supporting the hot tub! No idea why we have another major leak but this is considered a catastrophic failure all the way around. Let's see if Caldera is a reputable company and steps up to the plate!! We are done with it and we are demanding 100% refunded!! Our hot tub was purchased in August 2014 and delivered and installed in October of 2014. Rated 1 out of 5 by Jbrown37a from Very Displeased I purchased a Utopia Geneva from Sweetwater Hot Tubz here in San Antonio, TX less then thirteen days ago. At this point my wife and I are very displeased with the Watkins Caldera Spa product and the lack of service support and concern for the problems we reported to Sweetwater Hot Tubz personal. 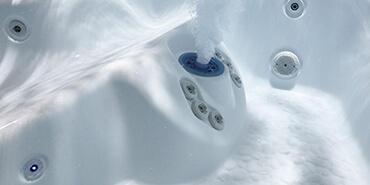 During the sale and purchase period we were sold on the high quality of the Caldera spa and the great service we could expect from Sweetwater Hot Tubz. We are finding both the spa quality and service support are far below what was stated. Our spa was delivered on May 30 2014, the next day we found that the spa had tripped the circuit breaker. When I reported this to the sales person he showed little concern. The night of June 5th was the first time we used the spa. On June 8th I checked the spa and found a part in the bottom of the spa. In our single use of the spa we had also found that the control panel buttons stick. Monday June 9th I discovered addition jet parts in the bottom of the spa but also that the control panel was malfunctioning. The display of the control panel had scrolled down to where parts of menu items were not visible and the tub would not respond to some button presses, its function was erratic. When these things were reported to the same store person again he showed little concern for how we believed these to be serious issues. Now we are waiting for a service person to show up over three days latter to repair a spa we've had less then two weeks. The Watkins Caldera spa product is not showing to be a quality product and the Sweetwater Hot Tubz service and support is far below what has been stated. Rated 1 out of 5 by Jill from Quality I have had my Caldera Spa for about 7 years. The sound system whent out in the first 6 months of having the spa. The dealer then advised me that the sound system that came installed in the spa was not water tight and not covered with warrenty. After about 5 years the siding started falling off and now the heat pump has gone out. The spa we had before this lasted 12 years with no issues. Caldera was not worth the money I paid. Rated 5 out of 5 by BP from Long time owner I have had my spa for seven years now. It performs well and is reliable. I would purchase this brand in the future. Rated 4 out of 5 by Newave from Nice Very relaxing - easy to maintain! Surprised it loses heat so fast in winter. Rated 4 out of 5 by MommaLuft from Great tub, a little difficult if you're short We love the tub. It is easy to maintain. The amount of jets are fantastic. The cover of the water filter comes out occasionally and I am 5'2" and I struggle to use the Lounge. Rated 4 out of 5 by John from Great Hot Tub I love the room in this hot tub. Everything about the inside is awesome. The outside looks cool, but for the price, seems cheap. The side panels use plastic clips and some areas use Velcro. Seems like stainless steel connections or something more robust would've made this better. Love the arrangement of all the jets! Rated 4 out of 5 by Muzz from 2017 Geneva Spa Review This is the 2nd spa I have owned with the prior spa being the Hot Springs Envoy. I have been using the new Geneva spa now for 6 weeks and can comment as follows about my personal experience. I will start with the pros: 1.) I enjoy the small three button control opposite the main control panel. This makes it simple to turn on and off lights and jets. 2.) Spa lighting is very customizable The needs improvement: 1.) Jet systems for two of the main seating areas is good, but for the remaining 4 seats, it is sub-par and almost useless. I only use the two main seats because of this. 2.) The location of the power being in the front of the spa does not fit most patio installations. Rather, it should be in the rear of the spa or opposite the main control. Mine now has a goofy conduit strung across the patio to get from the front left corner to the rear. 3.) Frog Ease system does not seem to work well. I have used the spa 6 weeks and the water quality is so bad I have to drain and fill the tub already. I have to add shock and PH increaser once a week just to keep the spa in acceptable water quality readings. 4.) The filter cover area should be designed or engineered to double as a cool down seat or one should be incorporated somewhere else. The cover and front plastic grate is cheap. On my Envoy, I could sit here and no issue. 5.) There should be ceramic filter option as I used to be able to clean my ceramic filters from my Envoy with a power washer which was great. I haven't found a good method yet to clean this paper filter. Rated 4 out of 5 by jasbo from Excellent Spa The Geneva is a wonderful family spa with a very nice assortment of seating stations allowing one to easily vary or focus their spa massage experience as desired. The only improvement I'd suggest is to make one of the seats a little deeper to accommodate taller users-for me that would ideally be the one with the neck jets. Rated 4 out of 5 by Kingjager from Good Hut Tub This is my third caldera spa and it has been a very good product. the only issue that I had was with the stereo speakers that failed after two years--but otherwise things have been good! Rated 4 out of 5 by Tat2b from Love it!! I do construction by trade and this tub really wipes away the day.We have only had it a couple months but It's been a getaway every evening after work. Rated 4 out of 5 by gb0524 from We LOVE our Geneva Spa The Geneva is so comfortable, we absolutely love it. It sits on our pool deck, and it gets used daily. We have had a few struggles, some probably related to high use such as knobs coming apart and speakers ceasing to work, but we also had an internal part fail which drained the spa. Luckily we caught that before the spa completely drained so we were able to shut it down so nothing else was damaged. This is our first spa so water care still remains challenging, but our Geneva gets a ton of use, especially teens, so I'm sure that is part of the challenge. We do love our Geneva, and it's a good value! Rated 4 out of 5 by Brip from Lovin it We love our spa. I did a lot of research and chose this brand as the best long term value. I really thought I wanted a control that I could use with my mobile phone, but after using the spa it turns it isn't necessary. Cracks developed on the outside, I guess I'll find out how good the warranty us. Rated 4 out of 5 by Max from Relaxing Experience The Geneva is a wonderful vacation at home. The filtration system could be improved on to give better water filtration but the cost to value ratio is incomparable to other brands. Rated 4 out of 5 by Ryno from Love my tub. I have Raynaulds, ( lose of blood flow to my hands and feet) what a relief my hot tub is. Love to sit under the stars before bed time. Factory worker for more than 40 years, sure is relaxing after a long day. Rated 4 out of 5 by Raider99 from Very Nice! This spa has very nice features for a fair price.Have not had it long enough to evaluate how ease of water maintenance compares to our previous hot tub. Rated 4 out of 5 by actionman1955 from Only heats to 103 . Love the tub except that it tops out at 103 degrees. Also the drain is plastic. Should be brass , to last. Dealer doesn't really want to work on any house calls. But overall a way good product ! Yes , I would buy one again. New models heat to 106. Rated 4 out of 5 by Booboo from Pretty good but wish I had gotten the Makena So I'll start by saying we really do like our spa. The upgraded lights give it a great effect and the jets are really strong. The lounge is way too tall for me even with a booster (I'm 5'5) so I don't really use that seat as I can't get the full effect of the jets on your feet. The whirlpool jet is in an awkward spot (at the very bottom of the seat) and you have to put yourself in very unnatural positions to be able to use it....it should be a few inches higher. Also, the neck jets are more of a gimmick as there is hardly any pressure coming from them but the rest of that seat is amazing. My only other complaint is that there are no jets in the foot ridge. For this reason alone I wish I had gotten the Makena as I'd rather have the jets in the right areas verses the fancy lights. Other than that I am happy with our purchase. I wish you could make adjustments on these things because if you could this spa would be perfect! Other than the top neck jets, the jets have a ton of power and provide a great massage. We enjoy the tub several times a week and the water care is pretty simple. It's been a great purchase and I would buy a Caldera again.....just likely a different model. Rated 4 out of 5 by Frank007 from 3rd year of enjoyment The first year we had the spa, it had a temperature sensor and main control panel go out on it. The store we bought it from was quick to respond and fix it. Since then it has work perfectly and provides hours of enjoyment. We live right on the beach so it is in a high salt environment, but works great. I would definitely recommend this hot tub. Rated 4 out of 5 by papatech from Just not comfortable for taller (5'11"+) people I like the hot tub alot "BUT" the layout makes it not as comfortable for taller people. My 5'4" wife loves it and with good reason. I first got hooked with hot tubs due to my friend's tub being older design, simpler and more "park bench" style all the way around. This Caldera design, every seat is different and when you have just one seat that fits you, it becomes "assigned seating" which isn't fun when you feel you have to kick someone out of that seat to enjoy the tub. Other than that, performance, electric use, ease of maintenance, looks, durability, are excellent. It's our first full year with the tub and I am satisfied.. I'll just have to man up and throw people out of my spot. My recommendation, GET IN THE SHOW ROOM TUB and sit for 10 minutes in each tub. A simpler and less expensive tub in my opinion may be more comfortable. Rated 4 out of 5 by Bob2012 from Great Tub Luke & Brenda at Tri-State Pool & Spa were great to work with. The Spa is well built and should provide many years of enjoyment. Rated 4 out of 5 by Marcus from Beautiful and Peaceful The tub is beautiful to look at and feels very relaxing when in it. I think we might have gone overboard with this particular model and the size of the room. The tub is enclosed on a indoor porch and the heat and moisture that this throws off might be a little too much for the type of windows we have and the wall mounted TV. Things tend to get moist. Rated 4 out of 5 by Tom 65 from Great Hot Tub We really enjoy the hot tub from Caldera. It is very relaxing and is especially great after a hard days work in the yard. Rated 4 out of 5 by Cammyd from Good Value I feel like I got the most spa for my money. Compared to Sundance and Bullfrog, I feel that we bought the best spa for our budget. Rated 4 out of 5 by Burbur6 from Ultimate Spa Experience We Love our spa!! We are very happy that we purchased it and wonder why we didn' get one sooner!!! Rated 4 out of 5 by Luvit from Great spa.. The best part of spa shopping is Wet Testing...Put your suit on and jump in...It is the only way to experience it. Business will fill the spa for you. When we went to purchase a spa, we were looking at the smaller one. Once we sat in the larger one, we knew it was the better purchase. It is very comfortable. Of course, there is always things to watch out for. Our biggest suggestion is start with the SOFT SPA...do not use the frog system. We had trouble for over a year trying to keep the chemicals balanced and it was a half hour ride to the store every time we needed the water tested. We developed rashes and it was from the unbalanced chemicals. With the soft spa, it just feels better and no rashes. ANd it is much easier to deal with. Don't waste time "trying" the other ones first. Also,water does evaporate often and you have to keep adding water....once a month. Cleaning is easy. Use spa purge..... We love our spa, especially now that the water balance is cleared up. Go for it!!! Rated 4 out of 5 by sparky from Good overall, but a couple of problems... Very good overall, but I have one exterior light that doesn't work anymore. Also, I think the filtration is not adequate. It seems like I need to run all the jets periodically even when I'm not using it to keep the water clear. Rated 4 out of 5 by heights from Excellent! Had a Caldera 25 years ago, did the homework then and it was the best. Retired, built a house in another area, did the homework again 25 years later, Caldera is still the best. The only update/feature they should add (as has been the case with some other Watkins-owned spa companies) is the salt water option. Rated 3 out of 5 by Joe from My spa Terrible wireless music system. My spa from day one had issues. Now the speakers got wet (go figure in a hot tub) and the system stopped working. 2 years!!??? I would not recommend a music system from Caldera ever! Rated 3 out of 5 by B from Bbrown We are not as impressed with this spa as we thought we would be. It is lacking in quality for the amount of money it cost . Rated 3 out of 5 by Dr. Brian from I Thought I'd like the Geneva better This is the 2nd Geneva I owned, I like the first one better. It seemed quieter & the water was easier to take care of. The jet power seemed better on the one we had 5 years ago. The electric bill seems more like $100 a month, not $20 a month. The step seems better. Rated 3 out of 5 by Askdrkatz from Poor customer service. Fittings and knobs often disconnect from post. Still having difficulty determining cause of water discoloration dispite numourous discussions and multiple normal water analysis by several sources. Provider and installer has not been able to find a remedy. My wife believes it is an intrinsic issue with the materials used in tubs manufacture. I am disappointed. I expected better for the price. Sorry I cannot recommend this to my friends. Rated 5 out of 5 by Badaxe from Geneva is it! Ever since i purchased my Caldera hot tub I have been very impressed with every aspect.I use the frog system and find it easy to keep my water quality. I USE MY Geneva tub at least 4 times a week and in the Michigan winter more ! I could not be more satisfied, this is my third tub and certainly the best. Rated 5 out of 5 by siddyf15 from Loving our Geneva Spa! Very happy with our Geneva spa thus far. Water is always warm and have had no issues thus far. Highly recommend! Rated 5 out of 5 by Bob from Ease of maintenance This hot tub is easy to care for and says clean and clear. Very comfortable in all seats. Rated 5 out of 5 by Trixie from The postion and power of the jets in this tub are amazing The comfort of this tub certainly makes the days sress just go away. Rated 5 out of 5 by shlar72 from Best Spa Around My wife and I love our Caldera. The design is beautiful and the options make for a wonderful experience. The leg and back jets feel amazing. Rated 5 out of 5 by Happy soaker! from How did I live without it?! I was apprehensive about owning a spa. I figure it would be a lot of work with little pay off. I was so wrong! Very easy to care for and we use it a lot more than I thought we would! I love it in the winter months and we also like the fact that we can easily control the temperature year round to fit our needs. I have a lot of pain issues and the therapeutic effects has improved my health a great deal and we look forward to using it as often as we can. Rated 5 out of 5 by JJ from Excellent Spa Great spa. Multiple strong jets. Plenty of seating. Low maintenance. Great lighting. Looks great. Reasonable price. Rated 5 out of 5 by squishy from Caldera Geneva spa The lounger is very comfortable and the foot jets are amazing! I use this spa as much as possible and it is very relaxing and soothing. Rated 5 out of 5 by Bad Axe from Hot Tub Bliss To anyone out there who is earnestly looking for a tub that will last them for years. I only recommend Caldera. I did my homework and feet work to replace the tub I have had for 5 years. The folks at Caldera explained the workings and chemical routine (they even wrote it down!) 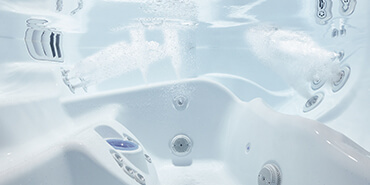 .The comfort, jet configuration, massage jets, layout and tub manufacture is impressive. No one who has tubbed has ever said anything but "I gotta look into these". My electric bill has gone down from my old tub bills and upkeep is a breeze. I recommend the FROG system. Constuction is beautiful and I chose the wood look exterior that matches my deck nicely. Lots of tubs out there to choose from but I would highly suggest you look at Caldera Hot Tubs. I am not a retailer just a very satisfied customer. Rated 5 out of 5 by Valrico from First Hot Tub This was our first hottub purchase and did a lot of research on-line before we decided on the Caldera Geneva. Best decision we could have made. My wife and I are in the tub 4-5 times a week and are 100%+ satisfied with the tub. Excellent quality, quiet and so relaxing! Rated 5 out of 5 by goodmeasure from The right choice!! This hot tub makes us think we are "on vacation" every time we turn on the CD player in our hot tub room and sit or recline for a most relaxing massage! Rated 5 out of 5 by hacker from Worth every penny It was a major purchase for us and it took a fair amount of time and research to come up with a particular model to purchase. We settled on Caldera based on their quality and tub design. Simple things like filter placement, foot well space and seat design set the Caldera apart from other manufacturers. Their warranty is also above all others. We use our tub on average 3 times a week and are so happy with the purchase! Rated 5 out of 5 by Dr. Bob from Got to have one In the last year we have used the spa at least 345 days of 360. Other than chemicals (much easier to use than out pool) it has been maintenance free. We love it. Very theraputic as well as relaxing. Best thing we've bought in years, well worth the price. Rated 5 out of 5 by DesertGirl from Such a great massage! I love this spa, it has been terrific. For those who like a deep massage, it has three awesome "stations" I like to rotate through for targeting different areas of the back and shoulders. There are good options for where kids can sit. My kids don't like the jets so it is nice there is Jets 1 and Jets 2 so you can partially have them on. The light is adequate. The lid is on a convertible bar and it is easy for me to get on and off by myself as a tall woman. I think it would need two seniors to do it comfortably. The lid gets dusty and needs to be wiped, something to get the pool guy (or your husband) trained to do. There are a few tricks they have up their sleeve if something gets caught in the filter the temp will flash. I wish this had a better way of indicating a filter clog. Also would be nice if there was a low water sensor as this is in use at our vacation rental and I worry if kids splash a bunch of water out, the water needs to be kept well above the jets. The headrests are difficult to replace if they come off. But honestly these are nitpicks, as we absolutely love the use of it. Rated 5 out of 5 by GeeGee from year round luxury On snowy nights ,we are the only people in our neighborhood outside...toasty warm ! Any time of year we love the pearl interior with color changing lights, it is really beautiful. Really, its like having a luxury vacation spot right outside the back door! Rated 5 out of 5 by 210tonyman from Great Purchase and Proven Quality of 8 years Ive had my Geneva for 8 yrs already! I'm now selling my house and will probably have to let it go. I will buy another Caldera because after 8 years I have had no problems. It shows very little age and it is so nice to have a spa right out our back door. I did plenty of research before choosing Caldera the first time and i went with Caldera because of the Value to Quality ratio. It has never let us down even after it was temporarily drained and shut off for about 6 months due to personal issues. It has been the best luxury item ive owned, very convenient and always very relaxing year round. Rated 5 out of 5 by me from PERFECT SOLUTION I have never owned a jacuzzi before my GENEVA. Thus, before making the investment, I spent a LOT of time researching and comparing models (I am an engineer). I even made a salesman take off a side panel so I could look at the parts and fittings to see what kind of rating they had (on the plastic, the rubber, the metal). I went through MANY name brands. Caldera kept coming to the top. I looked at construction specifically because my jacuzzi would be outside and facing a very hot southwest desert sun. After two years, I can tell you that the GENEVA has held up perfectly, still provides GREAT enjoyment for me and my family, and does not show any sign of problems. I would DEFINATELY buy it again. Rated 5 out of 5 by Lostin TN. from More than just hot water. Great dealer. They made the difference about which spa I was to buy. American pool and spa in Cookeville, Tn. Sandy and her crew did what was needed to get the job finished. Rated 5 out of 5 by Lee from My hot tub One of the best purchases ever! Don't wait. If you're on the fence about whether to spend the money then think no more. By speaking to different dealers I found a great company to do both the electric and the cement pad for a great price. My local spa dealer is the best in the business. The overall joy and relaxation I get out of my spa is amazing. I have brought the best elements of vacation home to my backyard. Rated 5 out of 5 by spa girl from Great investment There isn't a bad seat in this hot tub! It offers the best flexibility and most options for the money, and still has a small footprint. We'd buy this again! Rated 5 out of 5 by Dr. Bob from Sweet Dreams In the 5 months since we've had the spa, I think I have only gone to bed maybe 5 times without using it. Yes, I've used it daytime, but the primary use for me is to unwind at the end of the day so I can get a good night's sleep. 15-20 min. before bedtime & I sleep like a baby. Great in cold weather (the colder the better) but also in warmer weather as well. I also use the therapy jets for my back, neck, & shoulder massage. Fantastic. My initial concern was if it had enough power to really be theraputic - well, No Problems there!! Lots of power, and not just bubbles like at the fitness center hot tub - specifically directed & strategically placed. Easy to maintain, it's been totally problem free. One of the best investments we've ever made. Highly recommended. Rated 5 out of 5 by Shelli from Love our hot tub The spa looks beautiful, and feels even better. Winter, summer, spring and fall...it gets four seasons of use here. Even with the streak of 100 degree days we have had here in Kansas, we still find it comforting in the evening! 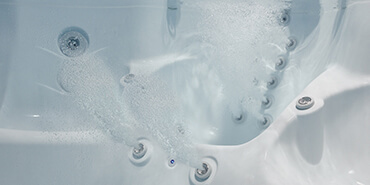 Rated 5 out of 5 by Relax42 from Daily Paradise We wanted to purchase a hot tub that would provide a form of daily relaxation, and our Caldera Spa has met our highest expectations. Rated 5 out of 5 by morgan53 from Wouldn't be without it! Our Geneva Spa has been a great addition to our preventative health care plan. We use it most every day and have cut our visits to the osteopath by 75% overall. In addition, after comparing the cost of running our Caldera Spa to other brands being used in our area, I am convinced we made the right choice! I never hesitate to recommend a Caldera to anyone looking to buy a spa. Rated 5 out of 5 by Dave47 from Extremely Satisified This is the second Caldera spa I've owned. My first was purchased more than 10-years ago in California but, after the sale, that particular dealership was less than enthusiastic about any type of customer service. Not so with my current spa purchased from Tradewind Spas in Novi, Michigan. My entire dealings with these fine folks has been nothing shy of outstanding! They are the only company I would even consider purchasing from should the need ever again arise. The spa itself is pure pleasure to use; especially when my muscles ache from over doing my yard work. And, there are a multitude and variety of water jets to give me the "just right" soothing massage I require. Weekly maintenance is very easy and whenever I change the water, I wax the part of the spa that's not submerged in water in order to preserve that brand new look. I also recommend the application of a good quality wax to the spa cover. I neglected to do this and after three years, it's beginning to fade. I intend to use a good cleaner and then wax the cover once I fully recover from my recent torn-bicep arm surgery. I am extremely glad I purchased this spa! No regrets!! Rated 5 out of 5 by eelder66 from Great Hot Tub.... Hot tubs are expensive but if you buy a good one it will last a long time. Caldera made a great one with the Geneva model. Big enough for my kids to use it as a pool and nice enough for my wife and I to enjoy. You will not be disappointed with this model. Plenty of room and great on energy. Rated 5 out of 5 by Brian40 from Geneva Hot Tub We really have enjoyed our Geneva over the last year. It is easy to use and take care of with only minor issues, we had 2 of those tiny speakers blow but with excellent customer service they were replaced quickly. 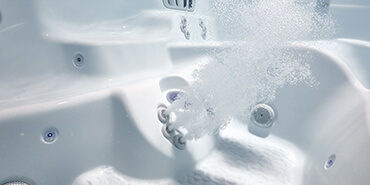 The build quality is otherwise excellent and the chemical treatments are easy to keep up with making it easy to use an always ready hot tub. The different stations sit very different and target different areas well. I do wish the headrest would adjust to accommodate people of different size but that is about all I would change. Rated 5 out of 5 by DGM7 from Best Spa I Have Owned This is the best Spa I have owned to date. Going on more than 2 years with this spa. This Spa is in the elements every day, not inside a screen cage porch, outside on a brick paver patio in Florida. This Spa has no signs of aging. With very little maintenence this Spa still looks new and runs like the day delivered. Strong jets that actually massage, I honestly can't say enough. Awesome. Rated 5 out of 5 by Davdy from What A Fantastic Addition to Our Backyard Paradise We have had our Geneva for 4 years and not 1 service call! It is so easy to take care of and takes so little time I almost could not believe it. But the best part is being able to pop off the cover jump in at 101 or 102 and relax those sore tired muscles no matter where they are on your body from you feet to your calves, to your boremus, to all parts of your back and neck, even your arms and hands. The waterfall is great to use on your face and head both the front and back!! The jet air and pressure are so adjustable you can customize each position for the preferences of anyone. When we first got it my husband was skeptical, now he uses it more than I do. So don't hesitate to add a Caldera spa to your lifestyle and fitness routine. It makes all the difference in the world! Rated 5 out of 5 by K8GR8 from New spa owner, and new Caldera owner, six months in... Husband did major pre-purchase research. Bought Caldera after a 'test soak' at local dealer ;-) We're '6' months into our purchase, which was part of a '5' figure back yard renovation (think stay-cation)! There are '4' of us in our family ranging in age from 47-12. We all love this spa, and use it, together and separately. Best part is that soaking together -- we laugh, talk, reconnect after busy days...a true family gathering place. So far we've had the spa through '3' seasons -- definitely a highlight is soaking everything but your head under bubbling warm water while it's snowing! My favorite is taking a soak in the am, a great start to the day. I also slip in after running at night -- we've never spent as much time in our backyard as we have since we bought the Geneva! '2' of our kids are tween/teenagers and they and their friends have a blast in the tub when they come over -- looking forward to our home being a gathering place for them and their friends as they grow. The 1 thing to know about this product is that the Geneva is the total package -- technology, value, (great energy efficiency, we haven't seen any increase in electric bill), ease of use, (water care has taken us a bit to get used to, likely bc we are new spa owners and very detail oriented), dealer-support, luxury. So happy with our purchase; no regrets. Rated 5 out of 5 by Pop Pop from Love It! Bought a Caldera 10 years ago and loved it. Moved and "had" to buy a new one. It's even better! Very easy to maintain, holds the heat better and great seating choices. We use it ourselves, with our kids and grandkids. It's just a joy. Rated 5 out of 5 by Fanaticfem from Still loving my spa We purchased our Geneva Caldera spa about a year ago. I waited to review it because I wanted to see how it held up through the four seasons. We had a rough winter, sub-zero temps and snow, and our spa sits on our patio only partially covered under our deck. We kept it running at 102 degrees and l was surprised we had no issues and I didn't notice a major impact on our utility bill. The most thrilling times we had using the spa were on these chilly evenings with the snow falling down on you. We drained the spa in the spring as you should twice a year, and that was no issue. Maintenance doesn't require much effort. Every few weeks we will take a water sample to our dealer for testing and advice, to be sure we have the right chemical balance. If we get too many bubbles in it from laundered swim wear or lotions, we just add some bubble remover and it gets rid of them. When the spa arrived and was setup, after using it the first couple of times we noticed a few of the jet caps popped off. This wasn't a big deal though. Probably weren't tightened up enough or got loose during setup. I just had to twist them back on and we haven't had any pop off since. The seat we all love most is the chaise lounge. The leg and foot massage jets are wonderful. I'm only 5'3" and it took me a while to figure out how to maneuver the jets and my seating position to keep still. It's more suitable for someone taller, but I love it as well. One feature I wasn't as impressed with are the neck jets in the captains chair. The jets are just a stream of water trickling on my shoulders and it is loud since it is by my ears. Also, someone taller will sit up higher, so these jets only trickle on their back and it isn't doing much for them. I tend to turn them off. The hand jets on this chair are awesome though. The other main chair is great for my lower back and I love that the jets are adjustable. I tend to rotate through these 3 main chairs to get the most out of my experience. Overall I am still loving my spa after nearly a year and glad we decided to make this purchase. Rated 5 out of 5 by Dr. Bob from The best product ever! We have had our spa for 4 years now and it's been virtually maintenance free (other than changing the water every 6-7 months). We use it year round (in Texas) although winter is the most fun. As a relaxing tool before bedtime, or massage therapy anytime, It's the best and most used thing we've ever bought. Worth the money? You Bet! Thank you Caldera for such a Quality Product. Rated 5 out of 5 by Pete399 from Amazing Experience Spas have come along way in a few years. This tub is easy to car for and almost runs itself. It has great jets that get to muscles our other tubs never reached without some body twisting. No regrets about s this high quality tub. And our friends love it too! We get cold in the winter but no problems with out tub and its great on a cold night. Rated 5 out of 5 by Mike at the Lake from Terrific Hot Tub! We have owned out Caldera Hot Tub for a year now with zero issues. It is exactly what we wanted. Plenty of jets, plenty of power, lot of seating options for whatever mood you are in and plenty of lighting options. It looks great and works great. We could not be happier. Rated 5 out of 5 by Peter from Caldera Geneva Spa We now own our second Caldera spa (hot tub). We bought the second one after we moved to a different home, and definitely wanted to stay with Caldera because of the quality and value of their products. The spa as worked wonderfully. It is energy efficient and easy to maintain chemical balance, and never leaks. The surface has remained smooth and shiny over several years of use. I would recommend Caldera to anyone looking for a quality spa that will hold up over time. Rated 5 out of 5 by Waterlogged from Geneva Spa Review Extremely happy with the quality of the spa. Unhappy with the dealer (Atlantic Spas and Billiards of Raleigh, NC) who did not quote the price of the Caldera steps and the spa arrived with a shoddy set of steps. Only complaint about the spa is that air bubbles creep into the lines overnight and the pumps have to be cycled through a couple of times to activate the jets. Rated 5 out of 5 by tmihalic from Awesome Hot Tub When we bought our Geneva, we were worried about the cost of electricity. Now, after 2 1/2 years of owning it, we can honestly admit that we have never really seen any up tick in our electricity costs. It is very economical and after working in the yard for a day, it is the first place we go. It's comfortable and soothing, and always hot and ready when we are. The Caldera Geneva is by far the best hot tub we have owned. Rated 5 out of 5 by BuddyHolly from Our First Hot Tub ! Having only had one day with our new Geneva I can only accurately rate some of the features as I have no long term data yet, but I want to rate our initial reactions to the Geneva by Caldera, our very first spa. We ordered our tub thru Lighthouse spas in Erie Pa and felt we were treated quite nice and pricing was fair based around some internet forum searching I had done. The tub was reviewed highly and a top of the line tub from a top of the line company for a top line price so my expectations are nothing but the Cadillac of tubs. I advised the dealer I was going to do my own install and he told me the GFCI sub panel was supplied and once I put a down payment on the tub he gave me the panel to get my electrical started. I found a site to download a manual as the electrical isn’t spelled out to well in the catalog brochure. Watkins uses a split GFCI no one else does and for a very good reason that I had to do some digging to find out why as they don’t advertise the reason. 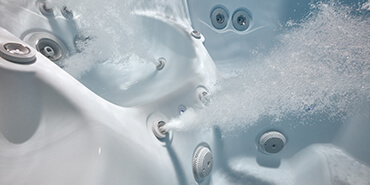 It has to do with keeping the spa heater on a separate GFCI and in the event of a heater failure in cold weather the tub still has power to go into survival mode running the pumps to circulate water buying you much more time to get a repair done. Living where our winters get down to -30F this is a very smart feature to have. The tub was delivered nicely packed the crew from Young’s spa did a professional job of moving it onto our deck and cleaning up. I had everything ready to go with the wiring and started right in on running the wiring to the main panel inside the tub. Code requires seal-tite conduit as the final leg and with (6) #10 wires in it it’s quite stiff and heavy. The first problem I had was getting the service panel off the end of the tub. If the owner’s manual would have been of any help it is shipped behind the panel. I had the one I downloaded and it shows remove seven screws and take cover off. I removed the screws and panel was still as tight as with the screws in place. I started pulling and lifting and could get a slight movement on one end but was afraid of breaking something. I got a block of wood and a bar and tried levering the panel upward and could hear slight sounds of wood creaking and such. There is also a LED light on this panel that is confusing as to what’s going to happen to it when the panel comes free. After about 30 minutes of messing around the panel popped free and I could see what was going on. First what was holding it was the black paint used to paint the wood frame inside was not dry when the cover was applied and it glued the panel on with the screw pressure. Secondly there is an aluminum French cleat hanger in the center of the panel with mating wedge surfaces that become self-locking. I have 42 years in industrial design and with five minutes of thought I could design a better cover for less cost. The ground light has a cord just long enough to keep from straining it and the way it snaps on and off is confusing and not well explained. I was a little disappointed to see the panel construction the outside surface is beautiful and looks like it will be long lasting and easily maintained but the inside frame work is made of the cheapest grade pine with staple and glue construction and I question how that wood will stand up to our climate. I located the power box and removed the two screws holding the thin plastic cover on and found I needed to now take off the corner cover also to get that off. The cover is attractive blue but also designed quite flimsy with large deep counter bores to get at the little screws that make putting it back on a chore. The box behind the cover looks to be ABS plastic and super thin and flimsy (quite bendy) it had a ¾ hole for my seal-tite connector and even though I see most of these with the raw wires just poked thru the hole with moisture and climate and the electronics also inside this box besides it’s code I wanted a sealed connection. I was afraid to use the lock nut as the teeth on the nut would cut thru the box so I put the lock nut on backwards. The wiring went fine I’m not a fan of push on connections but they went on and held fine. To engage and disengage them you jam a screwdriver in the slot above the wire hole and it takes a little fooling around to figure out how they work. They do include a page of paper with pictures giving a rough idea of how it’s done, but that explanation could be improved. When I went to replace the blue cover the screw holes didn’t line up. Between the strain the conduit put on the ABS box and that the same rivet that holds the ground connection you have to tighten also holds the one end of the strip of aluminum that has the two screw holes the one end was off almost a full screw width. No big deal but I had to bend things around some to get the screws started. I replaced the corner piece and that piece holds the mounting holes for the main cover so you have to make sure it’s on right or the main won’t sit right. It took two of us another 10 minutes to get the main panel on and seated in that French cleat and then a lot of wiggling it around to get the screws started. It was then I noticed the stainless screws that hold the cover on were dusted with a light coating of brown spray paint to match the faux wood panels and just normal removal and replacement once were enough to cause the paint to come off and the stainless to show. Filling the tub went easy, startup was smooth and the tub went from 52F to 100F in about 20 hours. The inside fit and finish is beautiful and perfect we did have one of the small rings around a jet blow off at start up but snapped back on and could have loosened in shipping. The spa controller is pretty simple to run and has nice features, one of the nicest being you can flip the display to read it from inside the tub. The seating is well thought out and the jets well placed. I would suggest anyone using steps try and orientate the tub and steps such that the steps face the cool down seat. That seat is the flattest and highest and makes getting in and out easy and safe. The placement of the diverter, and air controls and waterfall control seem a little less than intuitive in a couple spots but I’m sure we will catch on in time. After only the two of us using it for one evening we will both report the comfort and therapeutic level of this spa to be a perfect “5” and the reason we purchased it. We are new to this tub and this is our first tub but we have enjoyed others tubs to know this is what we wanted. The Frog system was easy to load and the dealer supplied us with one year’s worth of treatments as part of the purchase. So time will tell if we stick with this system or not. So for ease of care I’m also going to give it a perfect “5” but based on what we are expecting it to be. I will add that after pricing the frog cartridges for what they are and what’s in them they are quite pricey and that may play into our decision if we stick with that method of sanitizing. Energy I cannot also comment on as its only been powered up for 48 hours, but again if what I’m told is true I have to give it a “5”. The only two areas I will mark it down to a “4” is Quality & Value and the two run hand in hand. Of all the spas we looked at even at the Cleveland Home Show I have never seen one displayed with the front cover off and I don’t know why. I wouldn’t buy a car without taking a peak under the hood and every manufacture should be as proud of what’s inside the product as what the outside looks like. I don’t feel I have been overly critical in this review that was not my intention and we have every expectation of enjoying this product for many years to come. Rated 5 out of 5 by CptKirk from Loving my Geneva When I lived in Virginia I loved going to a Korean Spa with a large warm pool with multiple stations with jets massaging various parts of the body at each station. When I purchased my home I decided to do my best to recreate the experience in my own space. The Geneva has done that and more. It has a lounge seat as well as multiple other stations but also the lights and music through Bluetooth that create a little piece of paradise on my lanai. Very pleased with my purchase! Rated 5 out of 5 by Robert from Great spa This spa works great. Chemicals and ph so easy to regulate, better than past spas. Seating is great too. Highly suggest this spa! Rated 5 out of 5 by Vman from Caldera Geneva = RELAXATION Love my Spa and the sound system is very nice. The Spa is well constructed and the jet massage in all seats ranges from nice to fantastic especially the lounger! Do yourself a favor buy Caldera Geneva or any of the Utopia Models. Rated 5 out of 5 by ander from we love it! This is our best purchase ever! The entire family enjoys it! My favorite time is in the morning before everyone wake up. Its my time to relax before I start my day. My husband loves it after a long day a work...perfect to destress. the kids love it any time!! Rated 5 out of 5 by RH22 from Caldera Geneva I've had my Caldera Geneva spa for 5 years and just love it! It's easy to maintain, very relaxing and my whole family uses it almost year round. We live in TX and have 3 teenage boys. Rated 5 out of 5 by ConnieD11 from Spa review We have owned our spa for over 2 years. We love the room and comfort of this spa. We had a few problems but has been very good to us and it relaxes your body nicely. Rated 5 out of 5 by Paul80 from Great spa! We purchased the Geneva in November 2012 and have been using it regularly ever since! It certainly makes cold winter nights more enjoyable. The spa is easy to maintain and still looks brand new! The seats are very comfortable for adults but if you have very small children they will be limited in the seats they can use. They are fine in most spots but there are a couple of seats that are too deep for kids. The spa is built well and the shell continues to look like new. We are very happy with our Geneva! Rated 5 out of 5 by Dea from An Aaaaah.....moment We have had our spa about three months now and purchased it for my husband who has joint problems . So far it seems to be helping some with his mobility. Every time I get in to the warm water I keep saying Aaaah....It feels so good like I have my own personal masseuse. Each station is different so I can't say I have a favorite. They're all great. Rated 5 out of 5 by TL from outstanding investment This thing is great, the only improvement I would make is to the flow control and air valves. The sutup of some of the valves locations are kind of odd and out of reach from the area where the valves control. Rated 5 out of 5 by DrJ from Surprised I mostly bought this spa for my wife, but I think I have used it much more than her so far. I am surprised at how much it relaxes me in the evening and improves my sleep quality. I thought it was going to be complicated to care for when initially balancing the water, but after that first step, it has been quite easy. Highly recommend! Rated 5 out of 5 by 7thHeaven from Still a dream I still have to pinch myself sometimes to make sure I'm not dreaming and that I'm actually in my own backyard enjoying the health and relaxation benefits my spa bring to my life. Rated 5 out of 5 by kaddouh from love it Soothing and relaxing. Great utilization of space. Contoured seats make it one of the must comfortable spas we tested. Rated 5 out of 5 by 2ntnsv from Great tub I replaced an old tub with this one. The construction, design, heating,,, well, just everything was far better than my old one. The nicest thing is the recirculating pump and how quiet it is.This tub sits right outside our bedroom window, and sometimes I have to double check to make sure it is actually running. Rated 5 out of 5 by SpinGirl from We love our Caldera spa!! It has been the best investment and we sleep better and are more relaxed because of it! Rated 5 out of 5 by Jim from 2nd time and just as good This is my second Caldera hot tub and I couldn't be happier. I particularly like the spa frog system and the improved materials for the frame. The waterfall is also a nice feature. Rated 5 out of 5 by BJL from Best Spa i have ever had Love my new Caldera Spa! I can't believe what a difference from my old spa. Love all the jets, the lights, the waterfall al all. Very comfortable and easy to care for. Rated 5 out of 5 by mw from excellent fit and finish you can tell right when you get in that this is a high quality spa, it just has that feel. The comfort of the seats and the positions of the jets are perfect. Rated 5 out of 5 by Bevyj from Best purchase ever We love our hot tub. Very easy to maintain. Tried going without one after we ditched our last one 2 years ago. 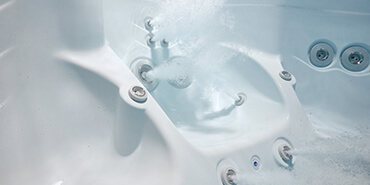 Couldn't live without one so we made a good choice to purchase the caldera tub. Rated 5 out of 5 by Junebug from Awesome Style, comfort and convenience says it all. We are very pleased with our purchase. The spa Frog system works great! Rated 5 out of 5 by Jasper from Caldera Geneva After going 18 years without a hot tub, we jumped back in with the purchase of a new Caldera Geneva Spa... and we couldn't be happier with or decision! Stylish, efficient and offers a wide variety of healthy jet options to relieve any minor muscle soreness that might develop over the long day. The only people happier about our purchase are friends and family that now come by often to enjoy as well! Rated 5 out of 5 by Nezzy from The best Hot Tub there is period! I have owned a Caldera Geneva Hot Tub for almost two years and have had no issues what so ever, ease of use and quality is superb. The local dealer (Aqua Oasis) is another reason that I purchased this brand and model. Rated 5 out of 5 by Intillekt from Great Tub Very well built. Happy with the purchase. Would definitely recommend to a friend! Rated 5 out of 5 by gerry67 from service was superb Daniel was great! I had a "expert" from my area come out to fix the problem with my spa and he could not figure out what was wrong, said it "could be" the heater. After being a couple hundred lighter in my wallet I called the Spa Warehouse in Seattle to see if they had any advice even though I am out of their regular service area. Daniel was personable, patient and very knowledgeable helping me troubleshoot to diagnose the problem. With his help I was able to isolate the cause and fix the problem. You are fortunate to have such a competent and professional service person. Thanks Daniel! In the future Daniel will be the first person I will be contacting for my spa needs and when considering a purchase of a new spa. Rated 5 out of 5 by Cable from We love the new design We absolutely love the new design of the Utopia Geneva! Our decision was between this tub and another similar brand. When Caldera decided to redesign the Geneva we were completely sold. The tub has a beautiful design and is so easy to use and care for. We are completely happy with our decision to purchase a Caldera and have truly enjoyed the upgrade to our patio. Rated 5 out of 5 by VeryBlessed from The Best Investment in Our Health We did a lot of research before choosing a Caldera spa. We knew what we wanted in a spa and decided to buy this particular model and brand because of reputation, size and the type of therapy were seeking. It did not disappoint at all! We LOVE the spa and we are in it almost daily. Sleep has improved and the reduction in our stress alone is worth the price. We highly recommend a Caldera spa! Rated 5 out of 5 by Washboy69 from Excellent 1st time spa purchase I use almost daily for sore back and legs/feet.. Wife uses almost daily for swollen /sore legs.. S.E. Michigan and we use it throughout the winter too; shovel a path to it and an umbrella over top of us. Rated 5 out of 5 by Caveman from Geneva Hot Tub We love our Hot Tub. We are in it just about every day even through the winter. Our tub is set up in the back yard patio. It helps relieve stress and muscle pain. My husband has a very physical job so it is a great tub for him. Very easy to take care of. Rated 5 out of 5 by Eric from Great tub I have a 2010 geneva. While i had what appears to be a pump issue. Your warrente took care of that with no issues. I live in a area that has a big alk problem. Which caused my heater to rust. Yea i said rust and fail. However thru great design i was able to replace in 30 min and had it up and running in no time. 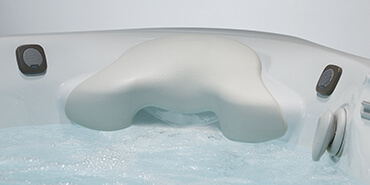 Overall i picked the caldara spas over others for reliabilty and ease of use . Great spa to this day it has run constantly since install yes 6 years. I dont know anyone who has that record for any tub. Rated 5 out of 5 by Allison from Great tub!! I have owned the same tub since 2004. I have had very few problems with this tub! That says a lot on how well built this tub is!! Very comfortable too!! Rated 5 out of 5 by DL from Happy once again! I want to thank Jason at Litehouse pools and spas in Erie,Pa. He had the misfortune of taking my phone call. Every now and then a person or a company gets an undeserving bad review out of frustration. He handled a very upset customer as a true professional and let me vent on the situation. He got the ball rolling and Caldera and Litehouse really stepped up and made it right. Both Caldera and Litehouse are five star companies across the board. Thank you once again! I am very pleased and I recommend Caldera spas and Litehouse if you're in the market for a hot tub. Rated 5 out of 5 by new owners! from First time spa owners Hitting BIG 50 have damaged back and tender tendons from years of weight lifting and life in general. Using the spa for 30 minutes to hour plus ~ 5 days a week for over a month and I am so very happy with the Caldera Geneva spa. Reducing muscle soreness, soothing tender tendons, and improving my overall feeling of relaxation (Better Chi ? ;-) has led to better sleep and reduced stress. Not feeling the oohs and aaass at work the following days from hard working weekends is a pleasure. Accessorized with a table, and a good umbrella for snow and rain use, privatized with some black bamboo fencing and my little at home vacation utopia is a reality! Rated 5 out of 5 by leitht from Excellent hot tub and great experience with the supplier So far after 2 weeks the tub has been great. Water care is quite simple with the Frog system. Rated 5 out of 5 by Happy hottubbers from Our Stay-cation Location! We love our spa! It's our very own private retreat. It had been became the hub for our most intimate conversations and favorite moments. Just the two of us can sit and relax together, soaking up every ounce of relaxation or invite friends to join for cocktails and hydration rejuvenation! The features, quality and ease of use allow us to enjoy with peace of mind and no stress! Rated 5 out of 5 by Hottub fanatic from Love It! We have owned several spas and this one is by far the favorite! The jets are amazing. We purchased from Branson Hot Tubs and Pools and the staff was great! They were very informative and can answer any question you have. Rated 5 out of 5 by Karen15 from Love My Spa Any time is a great time to enjoy the spa, don't matter if it is to relax my muscles or to melt away the stress. Rated 5 out of 5 by KB from Great tub for backyard get away Whether it's after a tough day at work or a brutal work out at the gym, hitting the tub in the back yard is like a quick vacation to get back into the right frame of mind. Rated 5 out of 5 by kcd from Love our Spa! We love our Caldera Geneva Spa. We use it almost everyday, summer and winter! My husband loves the lounger and really all the jets are incredible. We recommend Caldera. The tub is very easy to use and to keep clean. We empty It every 3 months and do a deep clean of the filter. We have owned ours for 2 years and have had no issues. Love everything about the Spa! Rated 5 out of 5 by Bea from I commend this company they stand by there product I bought a Geneva in 2005 the best thing I ever bought. In 2010 I had it cleaned by a techician and he noticed a bubble l. I called the company they honored the warranty and gave me a new one. What company does that caldera does it is the center point of my families enjoyment we love it. Rated 5 out of 5 by Lumber-Jack from Excellent spa now needs a timer I live in Canada and have loved my Geneva spa all year round since 2007 and the service has been excellent.... however, electricity prices are rising in Ontario and I want to put on a power timer for use except in winter. Is this ok to do....I cannot tell from the manuals? Rated 5 out of 5 by Valegirl from Love our new Geneva hot tub! We were ready to purchase the Martinique (a really nice tub as well) and at the last minute, due to a great sale price, we elected to upgrade to the Geneva. We are so happy we did. It is so roomy and has so many jets! We are still getting used to all of the diverter and air flow adjustments for the jets, but have found just playing with the settings is the easiest way to learn. The lounger and the Ecstaseat are awesome. We like the different height seats allowing shorter folks to still enjoy the tub. The foot and calf jets are like no other tub we have owned. We added the bluetooth sound system and it is so nice. We can't believe how clear the sound is even if you are not sitting in one of the seats with the dual speakers. The only things I would do to improve this tub would be to add built in cup holders and to somehow add a step inside for getting in and out. There is really no ideal place to get in or out, even with the exterior steps, so getting in and out is a bit awkward. Rated 5 out of 5 by Acat from Love my spa Love everything about my spa. Easy maintenance, comfortable, and very relaxing. Rated 5 out of 5 by JJAM from LIKE A NEW CAR I REPLACED A 10-11 YEAR OLD SPA AND WISH I HAD DONE IT SOONER. THE EASE OF SET UP AND THE SIMPLE BUT EFFICIENT SPA COVER LIFTER REMINDED ME WHAT A NEW CAR IS LIKE. YES, THE SPA EVEN SMELLS NEW. I AM IN THE SPA TWICE A DAY AND KNOW THAT THERE ARE MANY PEOPLE OUT THERE THAT NEED TO FIND OUT HOW HEALING A SPA CAN BE. Rated 5 out of 5 by LA from Utopia Geneva 2011 I love our Utopia Geneva Spa. I recently and needed a replacement part (valve) that was discontinued on my model year spa. After contacting several dealers in Salt Lake City where I live, my only option was to re-plumb the valve in my spa for the new updated part. I had a feeling that somewhere , somehow I would be able to find this discontinued part on some dealer's shelve in another state. I felt the local dealers were not interested in helping me out and didn't offer any other solutions. I decided to google Caldera dealers in Arizona and i was so lucky and fortunate to have found Arizona Hot Tub Company. I explained my situation over the phone and Helena took immediate action. She felt that it was worth a try to call the manufacturer and see if they had access to this discontinued part. She didn't have to do this and I was amazed at her willingness to go the extra mile. Within 24 hrs she called me back to let me know her contacts at the manufacture had found the part i needed and were willing to ship it directly to me! I realized the Helena is the owner of the dealer and also realized quickly why they are receiving such great reviews on google. Wish we had a dealer with service like this in Salt Lake City. Arizona Hot Tub Company deserve more than 5 stars. Overall the Caldera Spa is great and we are happy owners. Rated 5 out of 5 by Wendy from We are very happy and relaxed We are a super busy family with two athletic teenagers. We all use the hot tub regularly. Whether it's for therapeutic reasons, a snowy day or just because, you can always find one of us in there. Of course, our kids love sharing it with their friends too! One of our favorite features would be the blue tooth speakers!! Our spa is a must have!! Rated 5 out of 5 by Ginamimi from My spa I love my spa. Very relaxing and my friends love it. Best purchase ever. Rated 5 out of 5 by Customer from Geneva Great spa!!! This spa is much more comfortable then other brands we sat in. The only complaint would be why the Geneva doesn't come in panels that look like wood . We don't like the plastic look of it compared to a wood look. Also the plastic panels are cheap and I had to have my dealer redo all of the velcro strips that hold them on. That being said , the interior looks beautiful. The jets are great !! The interior is very comfortable as well. I would say the Geneva is definitely the best spa for the money out there right now. Don't use the spa frog system except for the mineral cartridge. Regular chlorine is way cheaper and easier to manage. If u keep the chlorine at the correct levels ur spa will not smell like chlorine does in a pool. Rated 5 out of 5 by Smcable3 from Such a great decision! We had been shopping for a hot tub for over a year when we wondered into a Caldera dealer on a trip to to Dallas. We loved the modern design of the tub and would have bought that day if we lived there. We immediately contacted the Caldera dealer in Oklahoma, who was great about explaining everything and making sure the tub would be perfect for us. It totally has been! It has the perfect balance of seating options and the jets are designed to hit different areas in each seat. It I still extremely easy to care for to our with the Frog system. Rated 5 out of 5 by Ringo from Nice and relaxing Just what you need for aching muscles after a long day of gardening. Rated 5 out of 5 by Asha55 from Perfect Portland relaxer Love soaking in the Geneva on cold winter nights or warm summer evenings. The jets provide great massage gor neck, back and feet, even hands! Use it at least every other day, and enjoy sharing with family or friends. Highly recommend!! Rated 5 out of 5 by John K from Premium Quality Spa I've owned the spa for approximately ten months and I would highly recommend it over other spas I have owned. The look fit and finish is outstanding. Rated 5 out of 5 by Troublebaker from Second-To-None Looked at several spa's and brands and ended up finding that the Caldera spa lineup was second-to-none in every way, and then some. From comfort and quality as well as overall ownership experience and time/cost to maintain I'm thankful I did my research and went with the best. I won't sugar coat the fact that you'll probably pay a bit more of a premium to own a Caldera, but once you're an owner, you quickly realize that it was a small price to pay for such quality and ease of use. Literally, they just work and are ready to go whenever you are. Big picture, quite possibly saving you money in the end. I also got the impression that the dealers that carry Caldera are more knowledgeable and invested in their products and customer service long-term. Sure, it's possible that this is nothing more than the enthusiasm of the staff I dealt with, but I did feel as though most other (non-Caldera) dealers were simply looking to move product. If you made it this far then my suggestion to you, if you're on the fence, is to go Caldera and never look back. Like me, you'll quickly be a Caldera customer for life. Rated 5 out of 5 by Btcountess from Beat Spa Ever! This is our fifth spa and is by far the BEST. We love the space and that we can have all jets on at once. In others we've had to pick and change back and forth. Also love the @ease system. Total relaxation - not constant maintenance. Rated 5 out of 5 by PghFANATIC from Awesome relaxing place Very well built and looks great. I would like it if the jets were a bit more powerful, but I'm one who likes rough waters. Rated 5 out of 5 by Greg from Extremely comfortable High quality product, the cover lift assist makes the llifting of the cover so much easier, however the attachments to the body of the pool seem a little frail. The Blue Tooth Sound System worked very well, I think one of the speakers may need to be replaced-sounds fuzzy. In general, I am very pleased with the product (pool) and would highly recommend it. The service rep has been very attentive. Rated 5 out of 5 by Ted from Trouble-free for 12 yrs Able to enjoy the tub without much intervention for the 12 yrs of ownership. Had one freeze in Jan. The tub would not restart after power interruption and we were away so the lines froze. Air pump issues encountered due to rodents. Screen appears to be a solution. Rated 5 out of 5 by MAT58 from Don't Wait We have owned the Caldera Geneva Spa for about two years. After "thinking" about purchase for many tears, I wonder why we hadn't made the purchase earlier. A day doesn't go by that my spouse doesn't say, "This is the best purchase we ever made. ", and I agree. We enjoy it daily through all the seasons from 98F Summer to -17F Winter. The routine care is simple and quick to perform; cleaning is much easier than I imagined; with a little attention to timing water changes are convenient to the Seasons. Rated 5 out of 5 by Lance from roomey Love the lounge bench and the water fall effect. The lighting is wonderful and can be tailored to individual taste. Rated 5 out of 5 by mamb from Why did we wait so long? at least once a week I tell my husband that this is the best thing we have ever purchased in our 33 years of marriage. we use the spa at least each evening and some days I am in it three times a day. we both feels so much better and our sleep quality is much improved. Rated 5 out of 5 by am123 from Great, spacious spa Our Geneva has been a wonderful addition to our outdoor space. Great for fitting in the family or kids with their friends. Relatively low maintenance with the frog system of chemical release. We have thoroughly enjoyed the spa! Rated 5 out of 5 by Tubby girl from Love my tubby I absolutely love my tub! I am in it all the time for random aches and pains. It's is so therapeutic. It's the best use of my $$ and has kept me from the doctors. So grateful for this amazing tub. Rated 5 out of 5 by Dave from outstanding hot tub We have been enjoying our new Caldera Geneva hot tub for almost a year. It replaced a Caldera Niagara that we had for 22 years. The new tub is energy efficient, and is very quiet in operation. Placement of the massaging jets in the contoured seats provides the ultimate in relaxation. I believe Caldera is the best value on the market. Rated 5 out of 5 by Geneva Spa Mama from Geneva Spa Mama Very relaxing! Love the lounge and the captains seat!! Rated 5 out of 5 by CaptainKirk from Everyone is Impressed My Geneva is great. It has loads of room, a variety of positions and jets, beautiful lights, integrated Bluetooth sound system, and stays clean and clear. Everyone that sees it is impressed. Very relaxing! Rated 5 out of 5 by Val from Love the hot tub!! We love the hot tub. It’s very comfortable. The most comfortable hot tub ever. Easy to maintain. Never had a problem with the tub. We have have owned the tub for over 5 years no issues or problems. Rated 5 out of 5 by Garota from Geneva Jacuzzi Beautiful Jacuzzi! Very spacious. We were looking for a jacuzzi that works for our tall family and this one is perfect. Fits the 5 of us perfectly. We love the water cascade and the massage jets. It looks beautiful at night with the light on. Very easy to maintain. I would definitely recommend this one. Rated 5 out of 5 by Tyler Bonnie from Some things you just can’t live without! After two major back operations I can honestly say that my Spa has contributed to my recovery! So happy to own one. Rated 5 out of 5 by GTE60 from New 2018 Geneva Just purchased a Geneva in 2018 after owning a Hot Spring Hot Tub for 18 years. Never had any issue with the Hot Spring. The Geneva is much more comfortable with more jets, more power, a inline FROG water system that keeps the water crystal clear with almost zero maintenance. It is an amazing product and we are very pleased with new Hot Tub. It is the only Hot Tub I have been in that I could truly say every seat in it is a good one. Rated 5 out of 5 by Baumee from Beautiful spa and the most relaxing spa EVER! The best investment we have made. It is a beautiful, luxurious, and very therapeutic. I have RA, and the lounger helps my ease my joint pain. Our previous spa was a Caldera (21 years old), and love this brand-very durable. Customer service is outstanding. Rated 5 out of 5 by [email protected] from Caldera Geneva...most comfortable, beautiful lounger and cabinet Our previous Caldera spa froze to death this past winter and lost it's life. It was a 2003 so it lasted about 15 years. It would have continued to go on easily but electricity failed and tub was effectively ruined. Alas, insurance replaced it! We chose the Geneva model for the lounger. I had had a lounger Hot Springs Envoy before and thought that was the "king's seat". Glad to have it back. We overlook a horse pasture with a million dollar view of million dollar horses we like to say. I have to say that I was intrigued by the Hot Springs models and did my due diligence when seeking replacements, but when comparing the cabinets and warranty, I went back to the Caldera. It has not one now, but TWO, POWERFUL foot jets that literally massage my feet like nothing else could. Hands. Machine. There is nothing like the blast of power my feet receive from this Caldera spa. My wife and I both love it. The jets that you can turn to tailor the jet's action to feel different is just wonderful. The CABINET is so modern, beautiful, unique and eye-catching. It fits our modern house perfectly, better than any other hot tub on the market. Thank you Caldera for the excellent backyard spa experience. Rated 5 out of 5 by Brad 17 from Long Term Review Bought our Geneva in 2009. Did a ton of on line research on tubs at the time knowing we wanted a therapy tub with a good track record. I knew from other people we know the pitfalls of owning a hot tub. This tub has never had any issues and I mean zero issues over the years (including control panel). Just now replacing the original cover (I cover the cover). Just a great well made product. Hard to find these days. Caldera for life! !